Q: What movie should have won best picture at the Oscars? tantrums. Holding consumers accountable for their behavior is the only way to change the current climate of worker abuse. Historically, unions are the most effective tool to guarantee a consistent basis for protections in the workplace. Historically, unions are also something corporations intensely ﬁght against. For example — a leaked video exposed one of Target’s anti-union employee training video, as originally reported by Salon in 2014. The article cites the new video, observing, “Workers are warned that ‘this is a very competitive business that we’re in,’ and that ‘If Target faced rigid union contracts like some of our competitors, our ability to serve our guests could suffer dramatically — and with fewer guests, what happens to our team?’” Employers must come to understand that service workers are not robots, and should not be expected to endure continued abuse on top of some of the lowest wages and weakest employment beneﬁts. Employers must understand that if they don’t want unions, they must take responsibility for protecting their frontline employees. If neither option is amenable, service industry employers should at least have the decency to publicly announce, in no uncertain terms, that they believe minimum-wage, barely-part-time, nobeneﬁt employees — often higher education students saddled collectively with trillions of dollars in school debt and no ﬁnancial assets — deserve the abuse they receive for the good of the billion-dollar multinational companies they serve. Actor Jussie Smollett pressed against the wall after turning himself in to central booking in Chicago. Photo credit: MCT Campus. rallied to support Smollett after the initial report of the attack. Others openly posed their suspicions. Almost everyone was quick to take to social media to express their opinions. Some, apparently, may have done so a bit too quickly, sparking conversations regarding conﬁrmation bias and media literacy. On Jan. 30, U.S. House Speaker Nancy Pelosi condemned the attack made on Smollett via Twitter. Nearly three weeks later, after it was revealed that the attack was allegedly staged, the tweet was deleted. According to Vanity Fair on Feb. 18, a spokesman for Pelosi said, “Given the turn in the investigation, we decided to no longer amplify the original accusation.” This stresses the importance of withholding judgement until all the true facts of any story are revealed, something the responsible news consumer would never fail to do. As each new leak made headlines, people were all too eager to favor whichever narrative conﬁrmed their biases before any further critical details emerged. “The Daily Show” host Trevor Noah touched on the situation during the Feb. 21 episode, stating, “That’s when I think you have to be even more vigilant [before jumping to conclusions], is when it conﬁrms everything you’ve believed.” If Smollett is convicted he will face a potential sentence of up to three years in prison as well as “restitution to compensate for the cost of the investigation,” according to NBC News. In the meantime, let’s all try to practice savvy media consumption by allowing our biases to standby as we patiently wait for the full scoop. an Diego Mesa College hosted their annual Open Mic Night on Feb. 20 in room M-211. The month of February, also known as Black History Month, was celebrated with a series of multiple events around campus. The events were designed to spread awareness of the struggles the black communities face through creating a safe haven for students. “I am powerful, I am great, I am the force that will change the world,” was shouted across the room. Christopher Starr began his poem with this “repeat after me” call. Starr, a 22-year-old black studies major, performed four of his poems. It gave poets the opportunity to speak out on living while black, inviting community members and students to express their experiences of being black in America using spoken word. The room was ﬁlled with comfort, emotion and love while the poets presented their pieces. The audience was welcoming and joyful, giving the room a sense of acceptance. The listeners shared similar reactions, snapping their ﬁngers, nodding their heads, and making comments that connected their experiences with the poets and their pieces. Laughter was shared throughout the room, giving the poets the opportunity to express their feelings openly. Many of the poets expressed their life lessons while others created lyrics and poems. with a music video called “Little Things” by India Arie, reminding everyone to acknowledge that the little things matter. Our voice matters, our lives matter, and our community matters. The poets shared the same passion, as well as similar life experiences. With the constant reminder of letting your voice be heard, students and community members were able to enjoy the Open Mic event and use it to their advantage. to have a deeper understanding of Klaus as a character. The reasons behind his drug addiction, his hatred towards his father, and why he begins to ﬁght himself to stay clean are all revealed as his character unfolds. Within the realm of character development, the show poses a question to its audience. What happens when an ordinary character takes an unexpected turn and develops into a villain instead of the hero they were once meant to be? An aspect of the show that was very enjoyable was the vibrant music that helped provide a layer of comedic effect during violent ﬁghting scenes. Way’s past as a musician clearly has an inﬂuence on the choice of music. A clear indicator of this is Way and Ray Toro’s collaborative rendition of “Happy Together” along with their original song, “Hazy Shade of Winter,” both used in the show. Despite its dark concept, the show is very entertaining, all while maintaining its superhero nature. According to NME.com, the show has been renewed for a second season. With its season one ﬁnale, a lot of questions arise. Will the gang be able to save the world without killing each other ﬁrst? Will Five ﬁnally get a decent cup of coffee? Find out in The Umbrella Academy’s upcoming season, scheduled to go into production at the end of 2019. “Steve,” 1976: Barkley Hendricks’ work will be featured in “Soul of a Nation” and appeared in Rogers’ lecture as examples of artists capturing the personality and uniqueness of the world around them. Photo courtesy: Mesa Art Department. decorative baubles beside a vase of ﬂowers. Hayden’s and Woodruff’s approaches to reclaiming their histories were poignant studies in the dilemma black individuals face in deﬁning their own cultural narratives. Rogers related it to her own experience as a black woman. “It’s like reconnecting,” she explained. “You can’t miss it because it wasn’t something you ever experienced, but … learning about history gives you a sense of identity.” She added, “You’re getting a fuller perspective.” Highlighting “Soul of a Nation” and the history behind the Black Power movement was important, Rogers thought, because it reﬂected today’s social climate. “I think everyone feels a sense of anxiety and frustration,” she said, “wondering what direction we’re headed in.” She continued, “Within this show, (the organizers are) focusing on this idea of unity, recognizing that there are things that are the soul of the nation that aren’t being addressed, that allow for certain actions or certain words to continue — and until we address those things, until we address the soul of the nation, nothing is going to change.” According to The Broad’s website, “Soul of a Nation” will feature more than 60 inﬂuential artists from 1963 to 1983, exhibiting paintings, sculptures, photography, and more from the civil rights and Black Power movements. of these systems. In an interview with Maureen Cavanaugh on a KPBS Midday Editions podcast he explains, “For many many years (I’ve) been trying to see where in the world are these infrastructures? What do they look like? And if we know that they’re there? How does it transform the way we see the world around us?” The exhibition entertains the belittling interest concerning the telecommunications world. Paglen told Cavanaugh, “It’s interesting the way we experience telecommunications systems, whether that’s the internet or email, its very abstract in the metaphors we use… But we don’t talk so much of the of the physicality of these kinds of systems.” “Sites Unseen” opened on Friday, Feb. 22 and will continue to be displayed until June 2 of this year. The Museum of Contemporary Art San Diego allows free admission to students with a valid student ID card. The museum also offers “Downtown at Sundown,” which guarantees free museum admission and exhibition tours on the third Thursday of every month. very week a STEM lecture is held on San Diego Mesa College campus and is open to the public. Climate Reality Leadershipa Corps, founded by Al Gore, spoke at Mesa Feb. 26 educating students on the different features of climate change, as well as the disasters that have developed alongside the issue. Dr. Cherry Robinson, the chairperson for the San Diego Chapter of the Climate Reality Leadership Corps, started the lecture called, “The Climate Reality Project” with a simple statement. “Even if you don’t believe in climate change,” she said, “what’s the worst that can happen when we take care of our planet?” Throughout the lecture, she made sure to remind everyone that our planet is our home. “The air Australians breathe is the air we breathe,” she continued, “the water that South Africa drinks will eventually be the water we drink, too. This is all our home. We need to take care of it.” The ﬁrst question she asked the audience was, “Must we change?” Robinson found this question most worthy of our time. The accumulation and extremity of natural disasters in recent years is comparable to the analogy about a frog in a boiling pot of water. If you put a frog in a boiling pot of water it will know it is too hot a jump right out. However, if you put a frog in the pot and then turn the burner on, bringing it to a slow boil, the frog will acclimate and never jump out. “This is what we are doing to ourselves, and we don’t seem to mind that it’s a little hotter,” Robinson was frustrated at the sigh she heard from the crowd. book. I wanted to see the face of the man that faced me with a riﬂe. What was fascinating was a post he made mere hours before his bullets met my meal. This post spoke about obstacles and the journeys in life. “For me, I feel like my childhood interpretation of freedom has been much trampled and a bit destroyed,” he wrote. “So my process to grasp a personal understanding of freedom, to regain freedom, may be of a somewhat of a different approach then the approaches used by others.” Premeditated, constructive, and destructive thoughts. He concluded his thought, “Don’t get this post misunderstood.” Following the incident, I have experienced multiple episodes of sensory overload when a loud noise happens near me. In these moments everything goes black and I throw my hands over my ears, just like I did at dinner. I don’t know when the episodes will end. I have received calls from a San Diego Detective and a Victim Advocate who are periodically checking on me and the other survivors. They have offered trauma and PTSD therapy to the victims for free. I am thankful I am not injured or dead, and that I didn’t witness someone else in poor physical health either. I cross my ﬁngers that lightning doesn’t strike twice and that this will never happen to me again. I can only wish no one would ever have to witness such a thing again. courses professors are allowed to teach on each campus. Raising the cap will give professors more free time and time with students. One of the major issues that plagues the adjunct professors is the travel between campuses. Many of the speakers during the rally detailed times where they picked their professions over their spouses, and young children. If a female adjunct were to become pregnant and need to go on maternity leave she would have to forfeit her classes, and her pay. AB 500 is the name of the bill that would allow female adjuncts to receive maternity leave. This would resolve one issue, but there would be no guarantee that her job will be waiting for her when she returns. There is no difference in the qualiﬁcations between full-time and part-time professors, but the difference in pay and beneﬁts is staggering. Payscale.com reports the average pay for adjunct professors is $31,357 annually, while the U.S. Board of Labor Statistics reports that the annual salary for a full time professor would be around $75,000. In the issue dated Feb. 19, 2019, The Mesa Press would like to correct the following errors: Page 3: In “Virginia’s Gov. should resign after blackface controversy,” the name of current Virginia Gov. Ralph Northam was spelled incorrectly. Also the name of former Gov. Douglas Wilder (ﬁrst black governor since Reconstruction) was wrongly attributed as Lt. Gov. Douglas Walker, who does not exist. 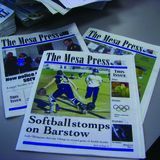 Page 5: In “Mesa Alumni are ‘Looking back, looking forward,’” the name of SDCCD was attributed as ‘San Diego City College District’ instead of ‘San Diego Community College District.’ Page 7: In “Men’s basketball gains hard-fought win,” the name of the basketball player Josh Edler Davis was spelled incorrectly. Page 8: In the article and photo caption for “Men’s volleyball falls in season opener,” the name of volleyball player Matthew Hursky was spelled incorrectly. it and brought it back to their side of the court. Lee scored two points and guard Joseph Davis scored one point after technical foul throws, bringing the score to 58-56 with Mesa still behind. 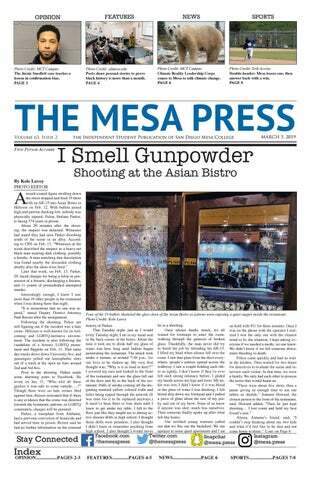 It was the closest Mesa came to catching up to Southwestern. With one minute and twenty three seconds left on the clock they called another time-out. After Mesa rejoined the court, some of the players’ ﬁsts went up in the air. They were ready to bring their A-game. When there was only one minute left, the score at 77-64, Southwestern was granted another free throw, bringing the game to its ﬁnal score of 79-64. When the clock hit 40 seconds, Southwestern’s guard Quincy Ferebee dribbled the ball without any attempt of interference from Mesa until the buzzer ended the game. The 2018-19 basketball season has come to end but the seasons playoffs are ongoing.